What Is A Married Put? You know the way you purchase car insurance in case something happens to your car, and you buy home insurance in case something happens to your home, and you buy health insurance in case something happens to you, well the married put is basically like buying an insurance policy on your portfolio in case something happens to it. The certainty in trading is that uncertainties will occur. 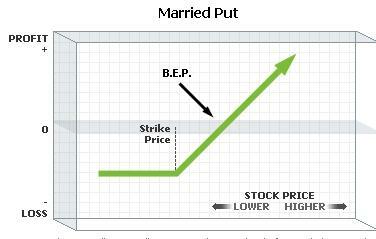 You may not know when or where or how or why but for sure a shock will happen and when it does, the married put has the potential to protect your portfolio against downside losses. It is a really valuable tool in volatile times and one that you should certainly know how to employ because after an accident has happened it’s often too late to buy the insurance policy! You need to know how to buy insurance through the married put before that has happened. For example, if you buy a married put a strike 100 on a stock trading at $100 per share and the stock drops to $10, the married put gives you the right to sell the stock at $100 even though the stock is trading down around $10 per share! Now what would you pay to have the right to sell a $10 stock for $100, well it turns out if you buy the insurance when the stock is up at $100, it may only cost a few dollars. So, for the protection afforded, it’s a really smart thing to do when downtrends are a major concern. The other nice aspect of the married put is that the upside potential is pretty much unlimited. As high as the stock goes as much as you make, minus of course what you paid for the put option to protect your stock in the first place.